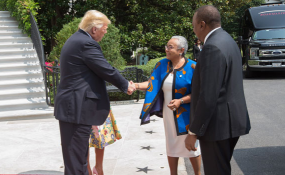 Presidents Donald Trump and Uhuru Kenyatta with First Ladies Melania Trump and Margaret Kenyatta. PRESIDENT TRUMP: Well, thank you very much. We are with President Kenyatta of a wonderful country that we do a lot of business with, Kenya. One of the most beautiful countries, from what I understand, Mr. President. We have lots of pictures and lots of people that tell me how beautiful your country is. And we do a lot of tourism. We do a lot of trade. And we do a lot of defense and security. And we’re working very much on security right now. And I appreciate you very much being with us and your staff. This is really great. Your representatives have been dealing with our representatives and making a lot of progress. We’re talking about a very major highway/roadway. And that seems to be going along well. That’s a very important project, I think, for your country. And so we appreciate, very much, you being at the White House and being with us. And we look forward to the discussion. PRESIDENT KENYATTA: Thank you very much. And thank you for your warm welcome. As you said, we’ve had strong relations that stretch back — all the way back to our own independence. And we are here to cement that partnership. We are here to strengthen the support we have received as a country, especially with regards to our security and defense cooperation has been immense. I had a good opportunity to speak with Mike, both in his former capacity and his current capacity. (Laughter.) And we work very well together, and I want to take this opportunity to appreciate that. But more importantly, even as we work on these aspects, what’s most important and what makes our country survive is the trade and investment partnership. I mean, this is really what we should work to deepen much more as we go forward. PRESIDENT KENYATTA: — for the mutual benefit of our two peoples. PRESIDENT TRUMP: Well, you are here on a very special day because the stock market is up almost 300 points today. We just signed a trade agreement with Mexico, and it’s a terrific agreement for everybody. It’s been in the works for a long time. It’s an agreement that a lot of people said couldn’t be done, and we did something, and it was very special. Great for our farmers, our workers. And our stock market just broke 26,000 for the first time ever in the history. So today we have the highest stock price we’ve ever had. And we’re very happy about that. I said that was going to happen and it’s happened. Everything I said is going to happen, it ends up happening. So you picked a good day to come. (Laughter.) We’re in a very good mood. PRESIDENT TRUMP: We’ll bring that over to Kenya. (Laughter.) Thank you very much, everybody. I appreciate it. Thank you. Thank you.